For yogis that love the sun and their sun salutations. A reminder to get outside and take time for self care. Everything is connected: body, breath, mind, nature. 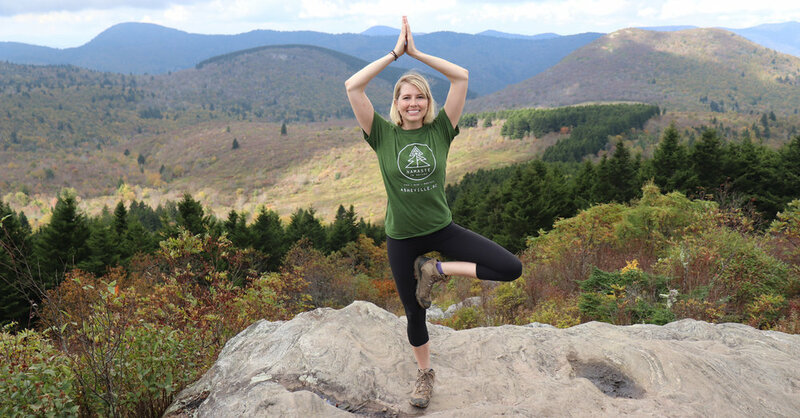 Namaste in Nature is so excited to partner with fellow Asheville-based small business Mount Inspiration Apparel to bring you some super cute & sustainable t-shirts designed by owner/founder Miranda Peterson. You might even call it a passion project as it combines all the things she’s passionate about: design, sustainability, yoga and nature. These Recover shirts (from Charlotte, NC) are soft and stretchy and made of recycled cotton and polyester, containing the equivalent of 6-14 plastic bottles each. There are no dyes used during the production process and soy based inks are used for the screen printing by local, loving hands. A portion of proceeds are donated to environmental non-profits.